Here is a sobering fact: At one time Ford sold about a million of these trucks in one year. In the automotive business, selling a million units of one particular model is not only a major feat, it is absolutely unheard of. There is no reference as to what that actually looks like. This is a number equal to last year’s sales of Mercedes-Benz, BMW, and Lexus combined. It seems impossible, but in a good economy, it can be done. For 37 years, Ford’s F-Series pickups lived on the top of the automotive sales charts in the U.S. Today, Ford can only sell in the hundreds of thousands — hundreds upon hundreds of thousands, in fact. Most of these sales go to business customers, both big and small, as well as to the public sector. Retail customers love them, too. It is no surprise that you see a lot of Ford trucks virtually everywhere you go. Sales are only half the story. 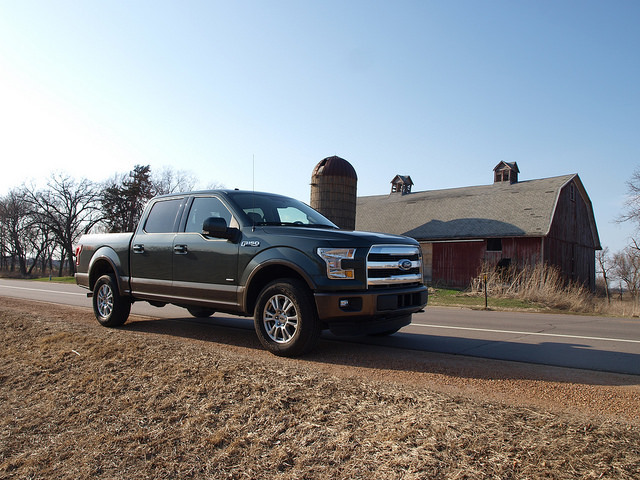 Among pickups, Ford maintains a loyal customer base. They have a wide majority of repeat buyers, going from generation to generation, sometimes skipping a generation. They also have a high propensity toward ownership longevity. Ford owners have no qualms racking up hundreds of thousands of miles on their F-Series. As being the biggest selling vehicle in America, Ford decided to take the biggest risk in its history. Normally, a pickup truck is all steel, from high-strength rolled-form steel in the frame to sturdy cabs and beds. However, the new 2015 F-150 pickup was made with high-strength, military-grade aluminum; the first vehicle of its kind to be built this way. To clarify, Ford used aluminum for the bed and cab, not the frame. It certainly caused a stir. While we were being assured of weight savings from aluminum components (Ford quotes a 700-pound savings over the last generation F-150) it had to take a lot of convincing that this truck still has the cache that put it out front for the past 37 years. I had to be convinced. Yes, even your auto reviewer, who happens to like trucks, needed some reassurance that Ford made the right move by going with aluminum on their most popular vehicle. To prove it, Ford delivered a 145-inch wheelbase version of the F-150 with the luxurious Lariat trim, a four-door SuperCrew cab and a short five-and-a-half foot bed. All it needed was a middle-aged chubby bear to drive it to find out whether it is all worth the paradigm change in pickup truck engineering. By changing the cab and bed construction to aluminum, Ford decided to give the F-150 a completely new look. Gone are the days of the angular cab. Instead, there is a blunter front end with an “industrial” 45 degree angle shape seen in various places. Each grade has a different grille finish and texture. It would either be a three horizontal bar setup or a simple set of horizontal lines, as in the XLT. This Lariat tester shows off a chrome three-bar design with horizontal inserts. This is augmented by a complicated, but effective, headlamp arrangement with a semi-block splitting the upper and lower lenses. The Lariat features a body-colored bumper and fog lamps to finish up the nose. Heading rearward, the familiar glasshouse from the previous generation F-150 was carried over, with a bit of a rear cant towards the end. Having the front lower “dip” helps in greater outward vision at the A-pillars. The bed design is a bit more three-dimensional now, with some folds to make it more stylish and provide continuity with the cab. The tailgate has a bit of a spoiler effect at the top and another fold/line never seen on any Ford pickup before, in the same 45 degree angle theme. 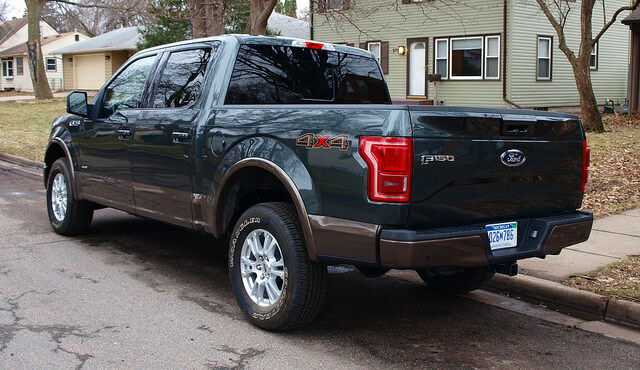 In all, the F-150’s look yielded mixed reviews from many observers, yet one cannot argue that is a huge advance in full-sized/half-ton pickup design. 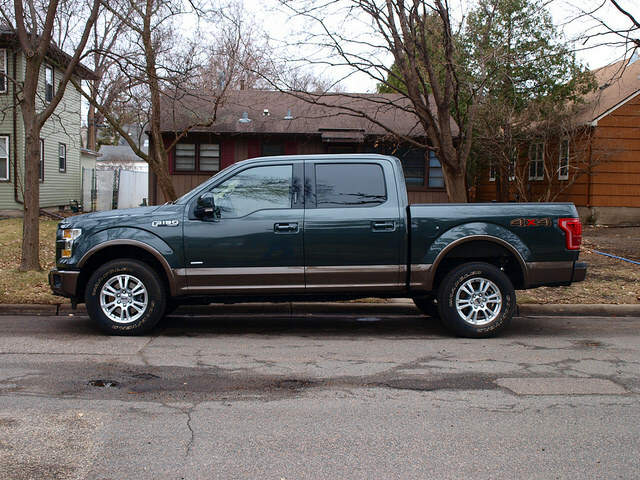 The most compelling part of this Lariat tester is the two-tone paint job. Remember back in the day when you could get a two-tone on your pickup and it would be any location on the side you wanted? You could make it a tri-tone with the main color on top and below with the secondary color right down the middle of the side along the belt and rocker line. Today’s two-tones usually ride the lower belt line and through the bumpers, especially stretched over this SuperCrew/five-and-a-half foot box configuration with Guard (a deep green) on top accented with Caribou (a tan/taupe shade) on the bottom. The paint combination alone is very outdoorsy and perfect for those who traverse deep into the woods. While you are going deep into the forest, hopefully you are enjoying the view from inside the huge SuperCrew. Just when I thought I’d seen some big rear seat spaces, the new SuperCrew offers a huge space. The seats are pretty comfortable and there’s leg room that would embarrass a Hyundai Equus or Kia K900. It is up front where the F-150 has improved. Material quality is up on the instrument panel and there are some compelling shapes to make it distinctive, including plenty of 45 degree angles found on the exterior. The cowl may seem a bit low, but it is positioned for even tall drivers to manage the 8-inch touch screen for MyFord Touch/SYNC. 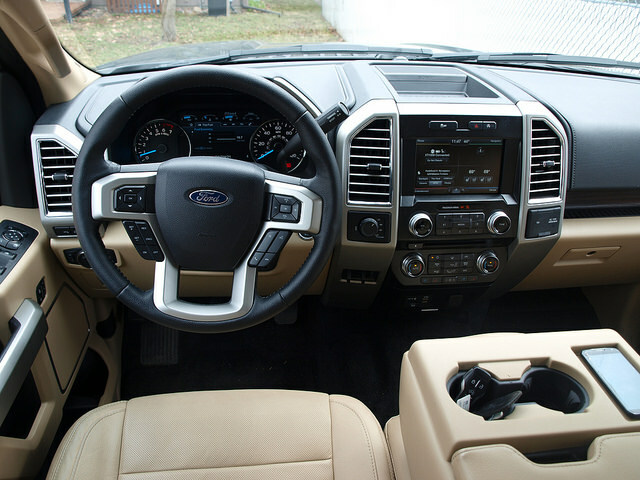 The biggest improvement is in the instrument cluster, anchored by an 8-inch Productivity Screen showing many functions of the F-150, including trip and fuel consumption information. You could also monitor trailer settings, see the health of the engine and other readouts using a multi-function set of buttons on the steering wheel. All buttons are familiar to those driving the latest Ford (and Lincoln) products, which are very good to the touch and operation. Front seats are plenty huge. They are comfortable and offer support with some bolstering available. The leather on the Lariat feels tough, but complaint for comfort. On the Lariat, there is an option for the middle front seat to be upright for a sixth person on board or lowered for a huge armrest with cup holders, a phone insert, and a small storage place. If you choose the six-seat configuration, you can open up the cushion for another storage place where the cup holders can be attached to the edge of the cushion. As much as some people are eagerly awaiting the arrival of SYNC3, you can tell there have been some marked improvements with the MyFord Touch/SYNC system. Bluetooth pairing and phone connection were quick. The navigation, climate, and audio functions are familiar and quite good. Sony provides 12 speakers of great sound throughout the cabin. To celebrate the fact that the 2015 F-150 went to an aluminum cab and bed and shed hundreds of pounds in the process, it was time for a new EcoBoost engine. This time, it is a 2.7-liter twin-turbocharged V6 with 325 horsepower and 375 pound-feet of torque. In this Lariat model, the EcoBoost was attached to a six-speed automatic transmission with a Tow Haul mode and the four-wheel drive system. Helping to make things more efficient for the EcoBoost 2.7 engine is the Auto Start-Stop feature, enabling the ignition to cut out at intersection stops. It just seems that today’s stop-start systems are less obtrusive than before. I can still hear it work, and just feel very slightly. With this configuration (the SuperCrew with the five-and-a-half foot bed) the towing capacity is 8,200 pounds with a payload of 2,160 pounds. One thing the F-150 has been known for is having one of the smoothest rides in the full-sized pickup business. That part is true: the F-150 offers a smooth, well-balanced ride. Like most pickups, rougher roads reveal some fight with the suspension system. The F-150 works hard to absorb the worst conditions. Even the best suspension systems try their best to manage roads that are simply falling apart. Handling is soft, but balanced through the curves. Lean and roll is minimal, thanks to an improved front suspension setup. Pickup trucks are burdened by a big steering wheel and a large turning radius. Though true in the F-150, thanks to a 145-inch wheelbase, the action and effort from the wheel is very good while reaction and response is on-point. On-center feel is excellent with no looseness at the wheel. Brakes are good, with nice pedal reaction. Though long in distance, normal and panic stops are solid and linear. The thing about turbocharged engines is when you have a vehicle with one or two on board, you expect to fill the tank with a premium-grade fuel. Not in the Ford F-150. You use regular fuel instead. That helps on the pocketbook, especially when this Lariat SuperCrew 4×4 turned an average fuel economy figure of 18.4MPG. This Lariat model came with the “small” tank, just 23 gallons. Though it may mean less fuel to pump for the money, it also means more fuel trips for those who like to drive long distances. The F-150 lineup starts with a base price of $25,800. For that money, you get a base XL trim in a regular cab with a 3.5-liter V6, an automatic transmission, and a few standard amenities. To get the Lariat tester here, with a payload upgrade, a towing package, two-tone paint, and the 2.7-liter EcoBoost V6, the sticker price came out to $51,765. However, if I went with the most popular and available trim — the XLT — and equip it similarly to the Lariat tester, I would save $4,500. The leather seating would be omitted, since it is not available on the XLT. An aluminum cab and bed, a rolled-form steel frame, a small twin-turbocharged V6, and a lot of gumption: that is how I would summarize the 2015 Ford F-150. Having driven almost every truck sold in this country, this provided the biggest surprises of them all. It is actually a good pickup truck. It should not surprise you that the F-150 is a good truck. But, the perception of being a top-selling product is that somehow quality gets shoved to the side when trying to push every unit out the door. On the contrary! What Ford is doing with the new 2015 F-150 is simply paying attention to the importance this truck is having on the marketplace. To be a good example of how new technology, different construction materials, and methodologies can be integrated on one of the most popular vehicles on the road today while maintaining the volumes necessary to retain its leadership. The Ford F-150 is better than before, making it simply a good truck. Better still, it’s a good truck to tow your float down Hennepin Avenue in the Ashley Rukes parade!